So I decided to give it a try without any kind of instructions what so ever. 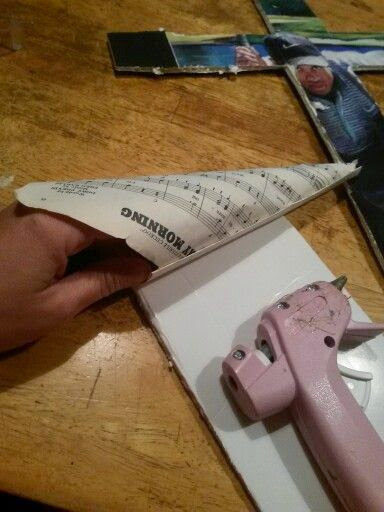 First I had to Google exactly how to make paper cones. Found it! 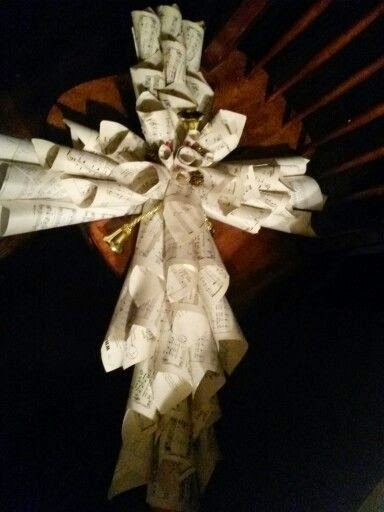 Secondly, where do I get old paper hymns? Bam! About three months ago I won an entire flat box full of nothing but old vintage spiritual church hymns for around $4.00. I had no idea at the time what to do with them, but something in me wanted them! And Now I know why. 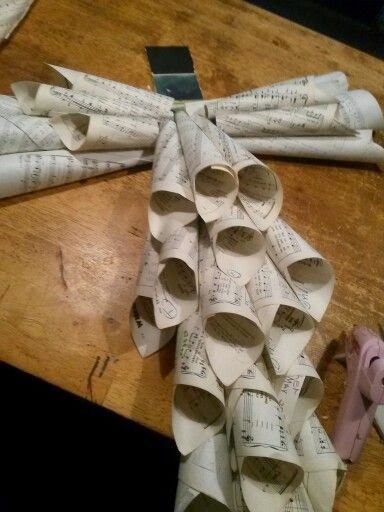 It's because I was bound and determined to make a Vintage Hymnal Paper Cone Cross Wreath! Maybe it was just for this very purpose? Who knows? But I'm super glad that I do have them on hand. And they are all loose pages already. 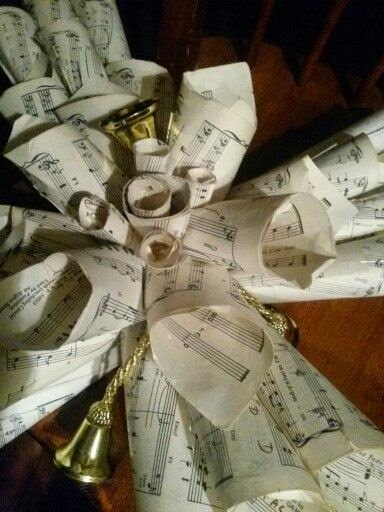 As they were used in a church at the piano or organ. 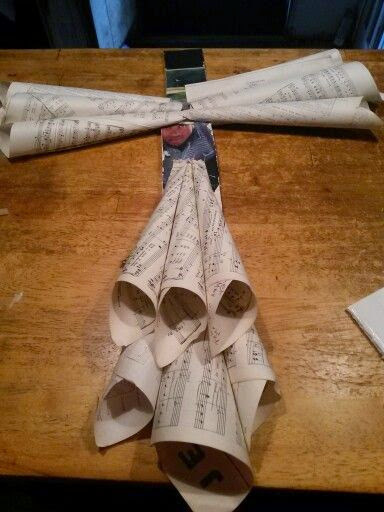 So here goes my try at making a beautiful Hymnal Paper Cone Cross Wreath. It turned out way better than I expected it to! 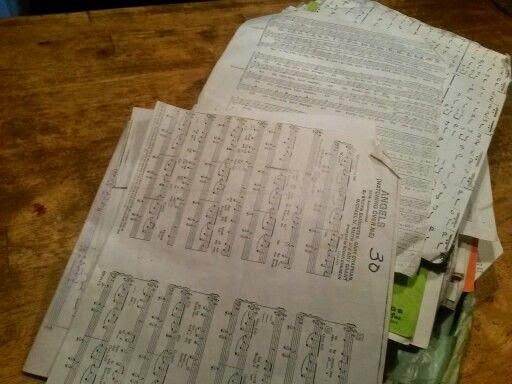 I got all my vintage sheet music out of the closet. Hey, if you don't have any I'm sure there's somewhere online that you could print off some and then just make copies! 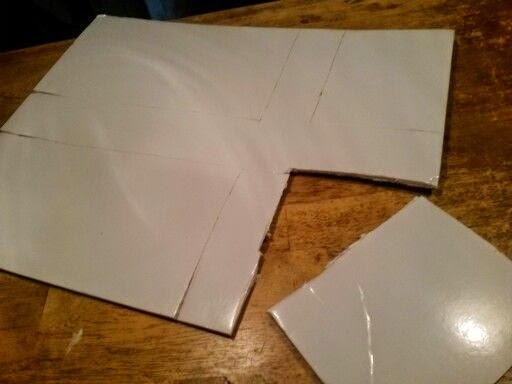 And then I got a big piece of the styrofoam board. You know the kind at the Dollar Mart that kids use for school displays. Well, I happen to have like 100 of these since I bought some sports art by the cases at a wholesale auction. Some have Tiger Woods and such on the back. But I use them for crafts! 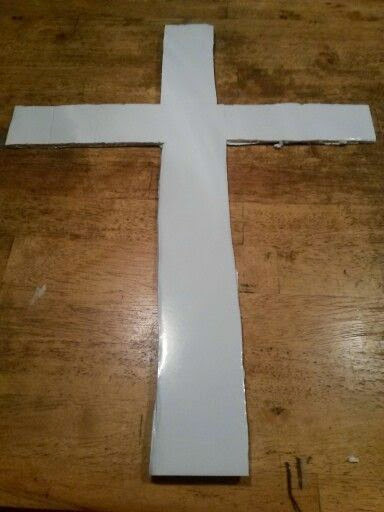 And I just free handed a cross outline on it to use as the base to glue all the paper cones too. I simply took a small bladed kitchen knife to cut it out because I could not find the exacto knife. As you can see, it's not perfect in any way shape or form. But it will do as my base. 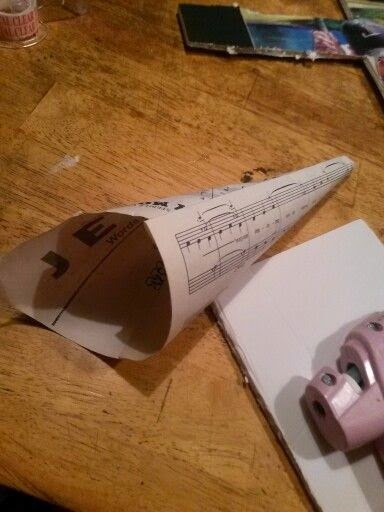 Next, I started fiddling with the paper cones. It's weird but this was the hardest part of the project for me. Don't laugh but it seriously took me about 20minutes to get the hang of making these. Here's a tip, you don't have to have them a perfect square like I was trying to do, before rolling them! In fact in the end, when I didn't make them perfectly square, they looked much better just all rolled up in an angle, corner to corner. YES, that is TIGER WOODS peeping at the camera! And then, once I started getting the hang of rolling the paper cones, it was starting to go a little bit easier. This first one was really way too loose, but I put it at the very bottom center as a focal, starting point. And then just kept adding and adding them. Oh yea, I stuck them on with high temperature glue sticks. They held great! And added even more.... And finally it was starting to look like something. and finally it's making sense! 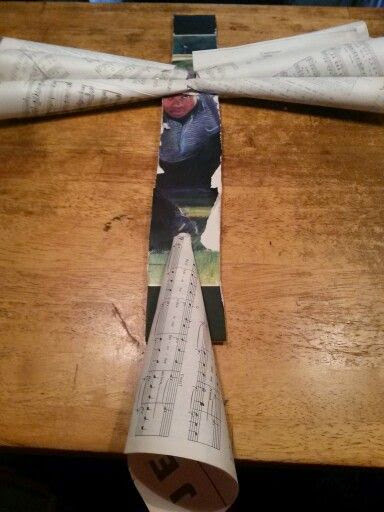 And as you see, to come in towards the middle, I started cutting the paper cones shorter and shorter. And just holding them up and working them in to where they looked like they would fit. Okay, shew! 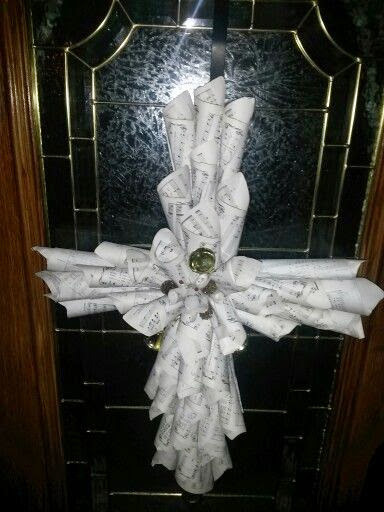 After getting the basic wreath made, for some reason mine looks really plain. So I dug out some Christmas ornaments. 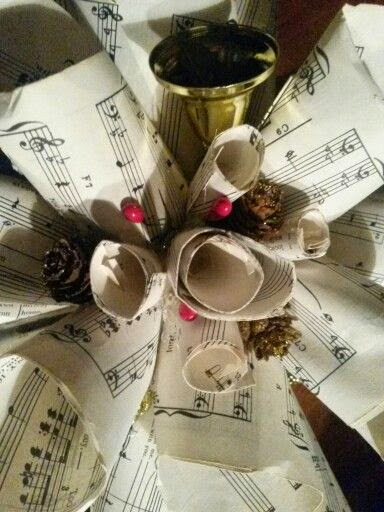 I love this door hanger with golds and pine cones so I'm going to tear it apart and use it as decorations on the wreath. 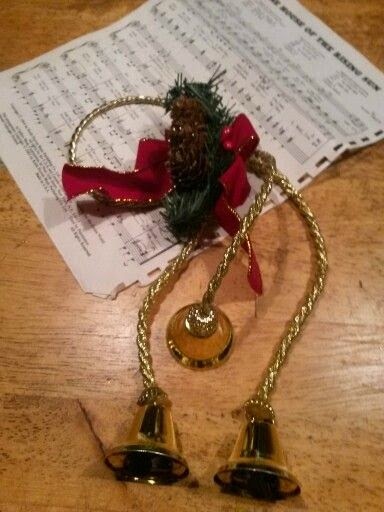 As you see above, I hot glued the ropes to the bells way in the middle, as far as I could stick them. Looks pretty good! And then, up there, see where I stuck the little pine cones in the middle along with the few sprigs of pip berry? Not too much, but just enough to add a touch of color. And for the back, I needed a hanger. 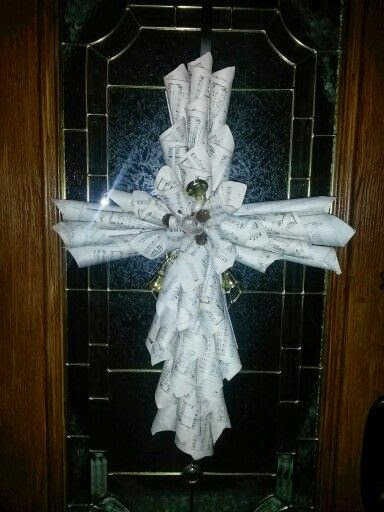 So I glued on the door hanger circle. It's holding fine. Isn't that just so beautiful? Such a pretty way to wake up. I love it even more now! But I am going to give this first one to my Aunt Marlene. And then the next one I may keep for myself. These would also be a great item to make and donate to your church auctions or fundraisers if you have those in your area. I'm sure they would be a hit. 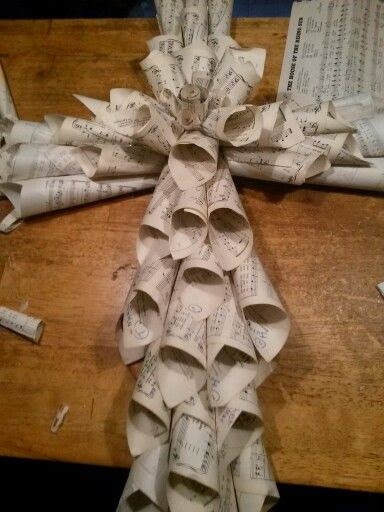 I'm going to try and make this for our church. Our church was badly vandalized, and everything inside was destroyed. 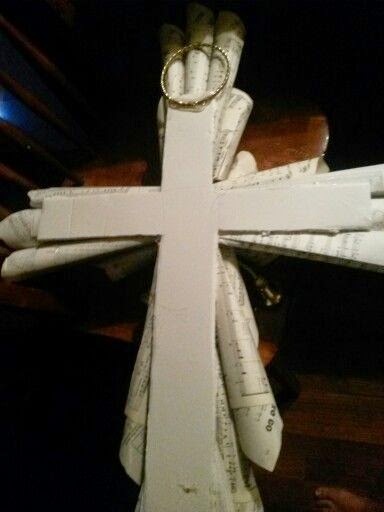 I got some of our old hymnals, and I'm going to try and make this for our pastor and his wife. So sorry to hear about your church. How horrible for someone to do that! 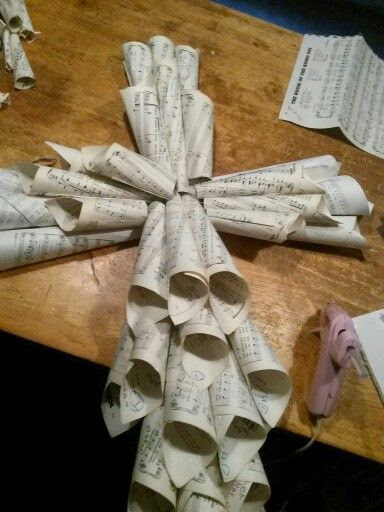 I'm sure you can make this, it turned out to be a lot easier than I thought at first. Just rolling them up was my most aggravating part. lol. But when you get to hot gluing them in place, you can really fill in all sorts of places that look bare very easy. That would be a great thing to do and give to your pastor and his wife! Hi Rebecca, thank you. 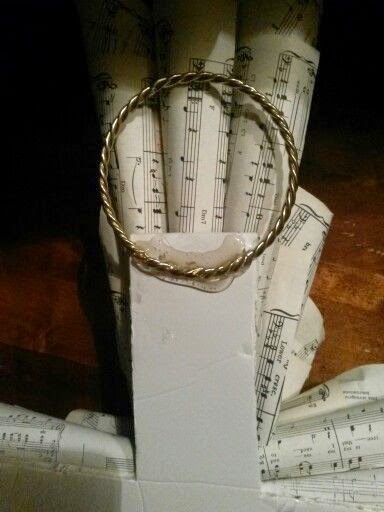 This would be a great gift to send especially since it will be handmade by you. Im sure they will enjoy it. 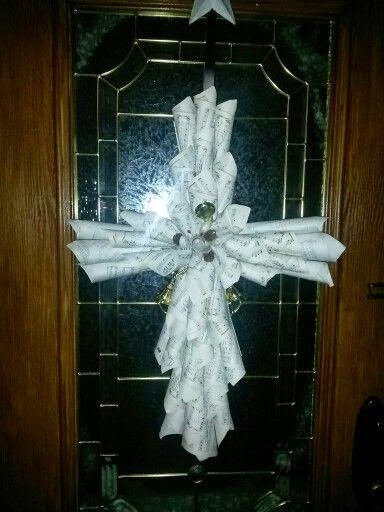 I made one for my aunt and she shared it with her church also. It was a big hit because they hadn't seen one like it before. Thanks again. And dont forget to maybe look on ebay for some sheet paper if you don't find it at thr Salvation Army. 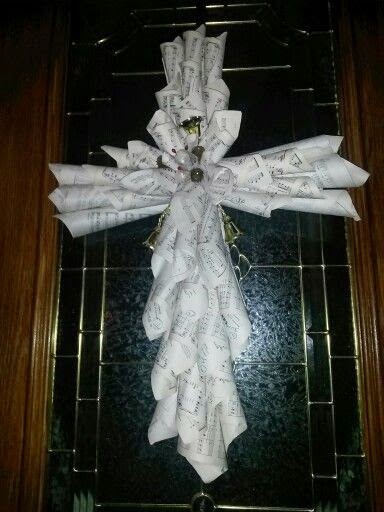 Hi Mindy, Oh what a great thing to do with the old hymnals. 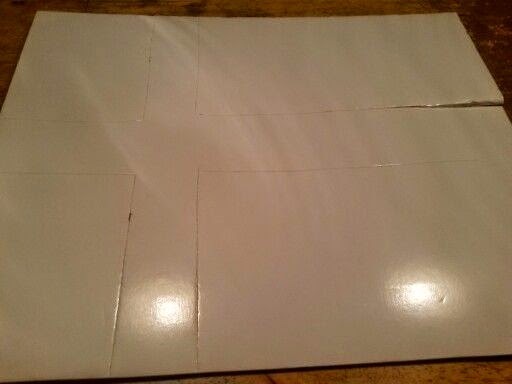 I cut the foam board to approximately 16 inches wide by around 21 inches long. This could vary to about any size you want as long as they look proportionaly right. This is great. 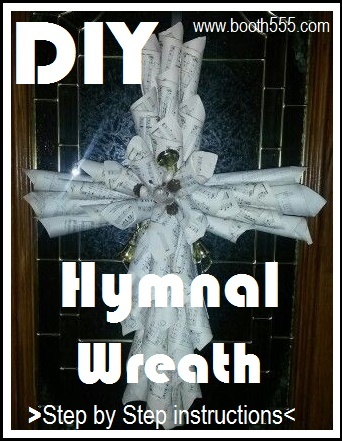 I'm making some from old hymnals also. I know some "charter" members of our church would love to have one as a gift. 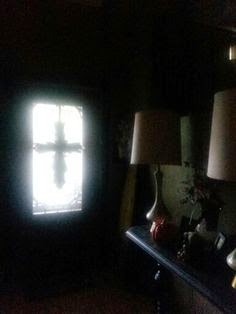 Thank you for sharing and I love the next morning picture.